I can’t get enough of Dan The Man and his wonderfully inspiring videos! I first found him on YouTube during my Juice Fast with Joan. I liked him then, and appreciated his voice. Now, his message resonates deeper. Maybe for no reason other than I have two cookies to love now: Sam and Stella! I think to appreciate DTM, you have to watch him about three times. Dan, you are so honest and bring so much love in your message. I don’t know why it should take more than one session to catch your vibe. Maybe you’re quality is similar to my husband’s: you both take up a lot of cosmic space in a room-and this happens to be a quality I deeply admire! Looking forward and at the present, what does DTM mean to me now? You remind me to ask myself, who am I? Who am I outside of the story I create of myself through my various roles? While there was a time I swore never to play another role in my life, perhaps now I am willing to play roles, or try them on rather, so long as they are authentic. Is that though an oxymoron: can a “role” be authentic? Recently I was enjoying an afternoon at the park. I noticed a woman with shorter hair, kept off her face with a folded scarf. She wore a loose, flowing skirt, and some comfortable tee. Hers is a look that appeals to me. I captured it in part during our honeymoon. Tony took me shopping at the Buffalo Exchange (thrift store) in Boulder, Colorado. There is a clean patchouli cell that floats around somewhere in my body. The fact that I so frequently forget to use deodorant can attest to that rogue cell. There is another rather uptight cell neighboring the flower child that craves white gloves, a glorious hat, beautiful lipstick, hair pulled back a la 1940, with attire from the 40s or 50s: 1950s when I am in my home, 1940s when I am out and about town. Is there an authentic essence our artistic side releases when we are able to dress and decorate our bodies? So, perhaps on Tuesday, you could catch me in my yoga paints, my hair air-dried, not a stitch of makeup on my face, save a touch of lip-gloss. 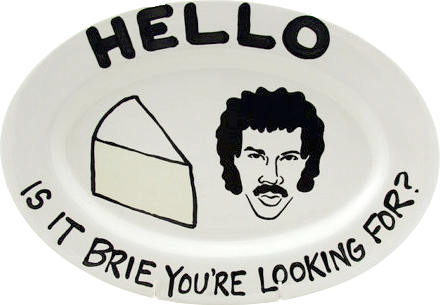 This is the Brie that appreciates and maybe even likes camping. I can embrace a long, flowing skirt and comfortable flip-flops, maybe even a “chic” pair of Birkenstocks. On Wednesday, you may find me paying $200 at the Bare Escentuals counter for a handful of beauty items. My legs are shaved (they haven’t been in some time), I’m wearing-dare I call them- pumps, a well tailored dress. I have a cut and color appointment in the near future or recent past. I’ll go ahead and stay out a bit longer than I would otherwise (leaving my 8 month old baby in the care of her daddy or grandparents) and get a manicure and pedicure, and yes, I’ll pay extra for an extended leg message. Of coarse there are the handful of days, I will have not washed my hair or body, although its not because I prefer myself unkempt, but rather because I’m busy taking care of other things and am caught in a cyclone to Oz or elsewhere. I ask myself, how do I pick which task to do first? How do my choices affect my priorities and what exactly are my priorities? The answer depends on what I’m wearing. Am I dressed in a full-skirt dress, buttoned up to the collar with a belt around my waist, donning my super cute, coordinated apron? Then my priorities reside within the walls and perimeter of my home. I’ll spend more time in my back yard. I’ll attempt to meal plan (I’ll consider buying myself a chef’s uniform to wear when I’m delighted in culinary adventures and expressions of love). I’ll notice the clutter of my 800 square foot home and attempt to do something about it, or plot to conquer it all in some plan that involves recruiting the right friends: Kelly and Joan. Did I skip my deodorant for the fifth time in a row and am I honestly not sure of the day of week when I last washed my hair? Priorities? Maybe, I recognize that I am once again in a bit of new baby survival mode. My priority is to participate, or at least show up. Do something around the house to help Tony. I think this happens on his days off: I power down. What about me? I might ask. I’ll spend time pinning onto my Writing Room. I’ll ask, why don’t I write more, when will I write? How will I make the time to write? When given a bit of time to myself, I’ll sneak off and read-even prep to do something meaningful with Sammie. The truth is, in this state I am too jumbled to decide on which priorities I should focus on first. This is perhaps where Ms. All-Ornothing resides. Dan The Man, where are you among these paragraphs? Where do you take up residence in my mercurial ride toward expressing and residing within my authentic self? Again, your message reminds me of the question. The question to keep at the forefront of my mind in my daily changing wardrobe. How do I want to best live my life? So, let’s talk food for a few more paragraphs. I believe in the healing power of food. I sense the dedication it can hold, like a religion. I want to bring health to my body and to my family’s body. I want joy in food and cooking (or preparing). I want quality of taste and adventure. I want to put good things into my body that will fuel me. But sometimes I also want the chocolate chip cookie, the frozen yogurt, the ice cream, chocolate bar, Nutella. What does it mean, actually, to say you have a sweet tooth? Is it just a sign of the addiction to sugar? My weakness is for sugar more than for a good steak, but I do enjoy a good steak, or seared ahi tuna, fresh fish, fresh oysters, oh, yes, and pasta and how could I forget about pizza?! I do love food. Question for you, Dan the Man, is there a marriage of variety and flavor and texture and adventure in the raw vegan diet? Maybe this should be the question I seek to answer. Oh, and what about warmth? Should I get the warmth from a tomato picked off the vine in the height of afternoon sun? The same for a fresh strawberry? Is this where I will find warmth in food? Warmth through garlic? Actually, I sense that a whole new world can open up to me in raw foods. My god, just start with the almond coconut yogurt! By the way, the almonds I soaked a few days ago, I believe are rotting. I’ve got to start with a new handful. The good news is I’ve discovered a big idea question to investigate: Find warmth and variety in raw foods. Maybe that is all I need. In life. Among my priorities. Seek warmth and variety. Provide warmth and variety. I think this could be a recipe for a life well spent. What do you think, Dan?